This entry was posted on March 19, 2013 by Jessica Anderson. Why should new spring trends be just for fashion? Trophies and Awards have exciting new trends as well, and we’re seeing many similarities between 2013 Fashion Trends and what’s hot in awards. Our awards experts have rounded up the top must-have award trends for spring 2013! We’ve seen a huge trend in color this year. Colorful Art Glass, color in resin trophies, and even colored clocks are huge this year. I love the combination of leather and color on this Howard Miller clock! Electric Blue meets snakeskin – fashion, function and recognition collide! One of the hot fashion color trends this spring is Black & White; in awards it’s Black and Silver. Plaques, crystal pieces, and clocks with this classic combination of colors have a modern, edgy look. Floral prints have been around forever, but this spring they’re updated in fresh, new colors and prints. Wall plaques are the floral wallpaper of the trophy industry. A little dated, and been around forever. What's exciting this year is that plaques are being revived with new colors and options. Stand-Up Plaques are a huge trend, as many offices have little wall space. Many new plaques come with easel backs that can be hung or can stand up. Another plaque trend is new materials being used, such as crystal and acrylic. I love the beautiful new Art Acrylic Plaques because they are unusual, colorful, and look like a piece of art instead of being just another walnut plaque! One new plaque innovation is the use of magnetic plates in perpetual plaques, which don’t require screws to attach. The customer can simply pull the plate off the plaque to move it around or to get it engraved. Why didn’t we think of this sooner! Logocut is the hottest trend! 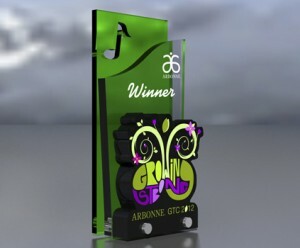 Create a custom, colorful, 3-D award in the shape of your logo! In fashion, it’s hot to have pieces with a little tummy showing here, back showing there. For awards, we have an amazing process, called Logocut, that creates custom, 3-D awards cut from acrylic. What we do is create a unique shape out of a company’s logo, and then layer other graphics in front or behind, for a peek-a boo effect. The finished award looks completely unique and modern, fully customized to the company’s look. Fantastic and eye catching! Mix things up with your awards this year by picking a trendy piece! Just like with your wardrobe, adding just one fun new item can really jazz up your awards program!